Barack Hussein Obama, Jr., the Democratic nominee for President, was born in Hawaii in August of 1961. Obama's mother was Stanley Ann Dunham, an 18-year-old white atheist freshman from Kansas and Washington state. 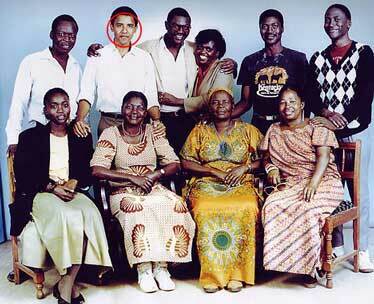 His father was Barack Obama, Sr., a 23-year-old black muslim-turned-atheist graduate student from Kenya. They met in a Russian language class during Ann's first semester. By the end of the semester, she was three months pregnant, and they were married in January. Neither family approved of the marriage. In many U.S. states (but not Hawaii) at that time, bi-racial marriages were illegal. Offspring of such unions was ostracized by both the black and white communities as not really belonging to either. Obama Senior's father reportedly opposed the marriage because he didn't want the Obama bloodline diluted with Caucasian blood. Obama Sr. was eventually offered a scholarship to continue his studies at Harvard. He turned down another scholarship to a school in New York that would have covered expenses for his family, and accepted the scholarship at Harvard, which did not. His explanation to Ann was "Why should I deny myself the best education?" This is just one example of the selfishness that characterized his life, according to those who knew him. He left young Barack and his mother behind before Barack was a year old and was never again part of his son's life. When Obama Sr. finished his degree at Harvard, he returned to Kenya and went to work as a government economist in Nairobi. Ann declined to accompany him back to Kenya and filed for divorce. Barack Obama only met his father once after the senior Obama abandoned him as a toddler. That meeting took place when Barack was around 10 years old and his father paid a visit to Hawaii. Obama's mother can be forgiven for painting a romantic vision of his absent father for young Barack. Every little boy wants to believe his father is a great man. She explained his abandonment of them by saying that his scholarship wasn't enough to support his young family, so they stayed behind in Hawaii with Ann's parents. By the time Barack Obama traveled to Kenya for the first time to meet his African relatives, his father had been killed four years earlier in an alcohol-related car wreck in Nairobi. While there, Barack was confronted with a shocking picture of his father's life that was far different from that painted by his mother, and from that he'd fantasized about all his life. He learned that Barack Obama, Sr. was married to at least three women, always 2 at a time, and fathered eight children with four different women, something that disturbed him. When Barack Sr. left Kenya for Hawaii, where he met Barack Jr.'s mother Ann, he left behind a wife named Kezia, whom he married in a local tribal ceremony at age 18. They had a son named Abongo (also known as Roy or Malik), born in 1958, and at the time he left for Hawaii, Kezia was pregnant with Auma, the senior Obama's only daughter. She was born in 1960, just the year before Ann Dunham gave birth to Barack Obama, Jr., in Hawaii. During his time at Harvard, while black wife Kezia and children Roy and Auma lived in Kenya, and white wife Ann and son Barack lived in Hawaii, the senior Obama began a relationship with a Harvard classmate, Ruth Nidesand, a white American school teacher. We have heard very little mention of Ruth, who now runs a kindergarten in Nairobi. This is particularly curious, since Barack Obama has so publicly embraced his black African family, perhaps to bolster his bid to be the first "black" President of the United States. Ruth followed Obama Sr. back to Kenya after he received his degree from Harvard. There, they eventually married and lived the affluent life of a government bureaucrat (he was an economist for the Ministry of Finance) in Nairobi. They had two sons, Mark (1964), and David, before being divorced amid whispered rumors that Barack Sr. was an abusive alcoholic who routinely came home inebriated, and brutally beat his wife. Ruth remarried and her sons took their stepfather's name, Ndesandjo, which is strangely similar to their mother's maiden name. David was killed in a motorcycle accident. The senior Obama, despite living in other places with other wives, kept returning to Kezia throughout his life. They had a son named Abo born in 1968, and another son named Bernard, born in 1970. The youngest Obama son, George, was born to the fourth woman, Jael, in Nairobi. It is reported that Barack Sr. was planning to marry her at the time of his death. (Apparently polygamy was common in Africa.) George, only six months old when his father died, lives today in a corrugated tin shack in the slums of Nairobi and reportedly gets by on $1 a day. Barack Obama is promising to solve your economic problems, but has done nothing to help his half-brother escape the dangers of life in the slums. Yet his own family lives in a $1.65 million dollar home they bought with the help of convicted felon Tony Rezko's wife. There are conflicting reports on the current whereabouts of Obama's other half-siblings. Some reports say that all except George and Mark live either in the UK or the US. Other reports say Auma and Roy have returned to Kenya. Mark lives and works in China, promoting Chinese goods to U,S. companies. Published reports indicate that Mark has requested big brother Barack's assistance in easing restrictions on Chinese goods entering the U.S.
Barack Obama and Mark Ndesandjo have very different views of their father. Barack Obama has a romanticized, larger-than-life and largely fantasized view of his absent father, while Mark remembers an all-too-real abusive alcoholic who made life rough for his wife and children. His alcohol problems contributed to the decline of his government career, and the humiliation of losing his job contributed to his drinking problem. Kezia, who now lives outside London, says she first learned about Ruth when Obama Sr. was injured in a car wreck in 1981 (the year before the accident that killed him) and his injuries were severe enough to require the amputation of both legs. She arrived in Nairobi to visit him in the hospital, and wondered who the white woman was she saw in her husband's room. That's when the elder Barack introduced her to his third wife and told her they had two children. Apparently that was the first time either woman knew about the other. Of Barack Obama Sr.'s eight children, only Mark and David, his sons with Ruth, had the luxury of living in the same home with their father. His other six children were essentially fatherless. Kezia also says that Barack's mother, Ann, traveled to Kenya after the senior Obama's death, and that the two women became fast friends. Kezia called Ann "like a sister to me." After Barack Obama's mother died in 1995 of ovarian cancer, it was Kezia who attended his swearing-in ceremony to the Illinois state senate. Barack stays in contact with her, and if he's elected, we will likely see her in a place of honor at the inauguration. An article in the UK's Evening Standard is far less charitable, calling the senior Obama "a drunken lecher" and a "bigot." It suggests that Barack Obama's fantasized version of his father that appears in his book "Dreams from my Father," is a convenient attempt to put forward the "story" he wants people to believe as he campaigns to be President. He'd prefer you believe his fantasy version of the man who "inspired" him to politics, rather than doing your own research to find the true story of the self-absorbed alcoholic womanizer who ultimately failed in his own political career because of a weakness for Scotch.